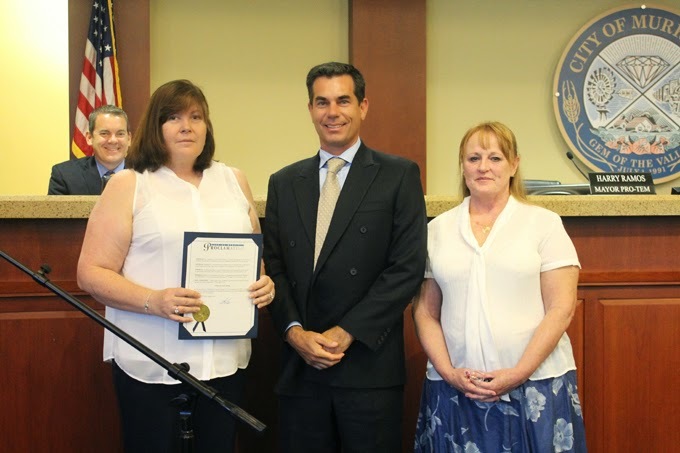 The City of Murrieta honored the Luiseno Chapter of the Daughters of the American Revolution with a special presentation during the Aug. 19 City Council meeting. The presentation was made by Mayor Alan Long to chapter members Lisa Petersen (left in photo) and Sue McClanahan in recognition of the chapter's service and in honor of the 227th anniversary on Sept. 17 of the framing of the U.S. Constitution. The presentation included a proclamation recognizing the week of Sept. 17-23 as Constitution Week. According to its national website, the Daughters of the American Revolution is "a non-profit, non-political volunteer women's service organization dedicated to promoting patriotism, preserving American history, and securing America's future through better education for children." Members are documented descendants of those who "aided in achieving American Independence."